"En avril 2012, les solistes, le chœur et orchestre du Volksoper Wien (l’opéra populaire de Vienne, Autriche) a réalisé une flashmob dans la gare de Vienne. Devant des passants et voyageurs aux yeux ébahis, ce sont d’autres passants, employés, qui deviennent peu à peu artistes…"
"... there will be a short delay..."
"Transtellar Cruise Lines would like to apologize to passengers for the continuing delay to this flight. We are currently awaiting the loading of our complement of small lemon-soaked paper napkins for your comfort, refreshment and hygiene during the journey. Meanwhile we thank you for your patience. The cabin crew will shortly be serving coffee and biscuits again.''.. "You're the autopilot?" said Zaphod. "Yes,'' said the voice from the flight console. "Yes,'' said the voice again, "there has been a delay. Passengers are to be kept temporarily in suspended animation, for their comfort and convenience. Coffee and biscuits are being served every year, after which passengers are returned to suspended animation for their continued comfort and convenience. Departure will take place when the flight stores are complete. We apologize for the delay.''.. "Delay?" he cried. "Have you seen the world outside this ship? It's a wasteland, a desert. Civilization's been and gone, man. There are no lemon-soaked paper napkins on the way from anywhere." TYWKIWDBI is also experiencing a slight delay. The pilot has elected to take another mental health break/blogcation. Service should be restored in a week or ten days. 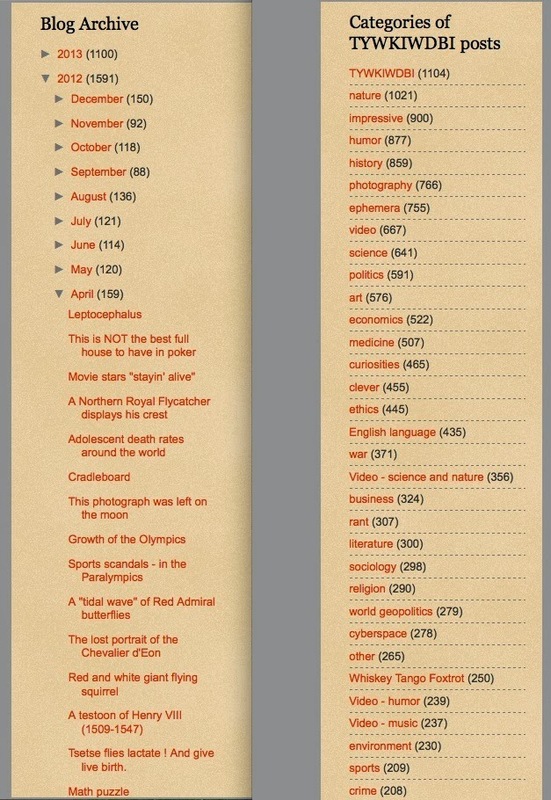 In the meantime, those who feel bereft of ways to avoid doing the work they are supposed to be doing are reminded of the extensive past posts here, which can be accessed by going to the right sidebar and scrolling down to either the expandable "archive" and choosing a month before you became a regular visitor, or by selecting a Category. Now please return to your seat. 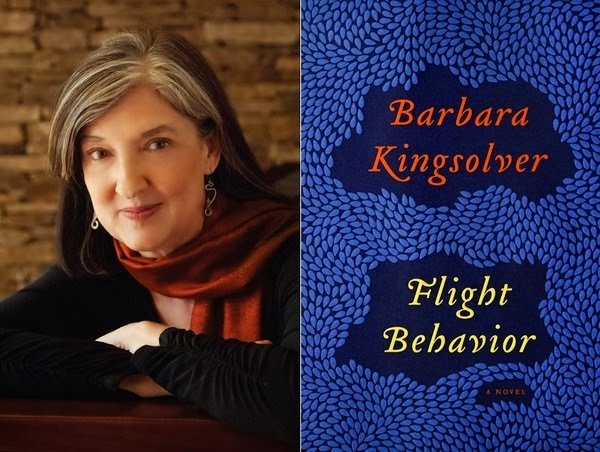 This was my first encounter with the work of award-winning author Barbara Kingsolver ("Her 1998 bestseller, The Poisonwood Bible, won the National Book Prize of South Africa, and was shortlisted for both the Pulitzer Prize and PEN/Faulkner Award.) I was directed to this particular book by a reader who (correctly) thought the discussion of Monarch butterflies so central to the book would be of interest to me. 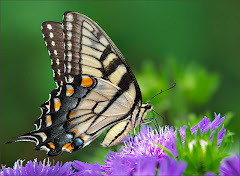 The title refers both to the migratory behavior of the Monarchs and (I presume) to the geographically-shorter but equally complex "flight" of the female protagonist from an increasingly restrictive lifestyle in the mountains of southern Appalachia. I found the latter aspect of the book more compelling than the commentary on climate change (which for me would amount to "preaching to the converted"). I spent 20+ years living in central Kentucky and working with many people whose lifestyle and worldview were not much different from that of Dellarobia Turnbow, the protagonist of the novel. Kingsolver's portrayal is "spot on" - not surprising, since she herself was raised in rural Kentucky. I had to look it up, since my Kentucky acquaintances never used the term. 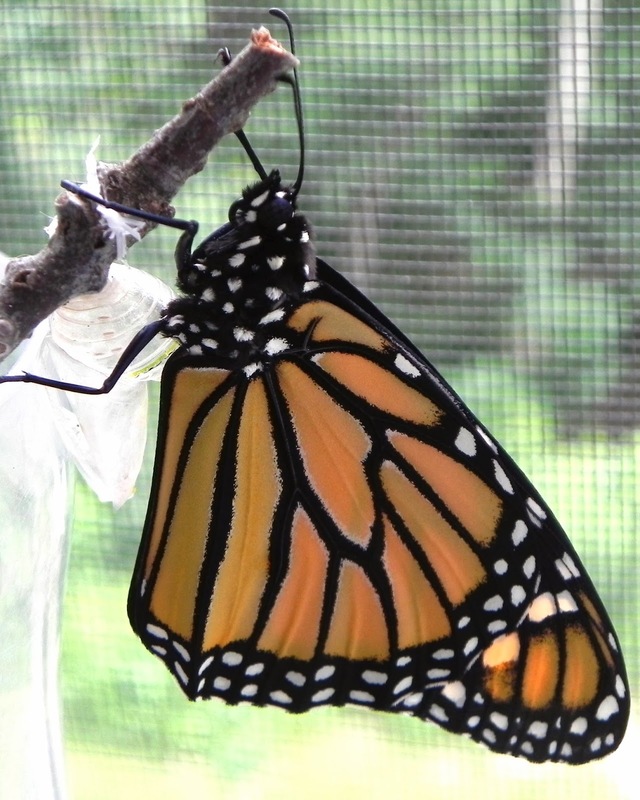 The name Monarch is probably related to the eponymous appellation "King Billy" used by Canadians; the butterfly has the black and orange colors associated with William of Orange, Coregent with Mary after the Glorious Revolution of 1688 and the hero of Protestant England for his victory over the Catholic James II at the Battle of the Boyne. "Her every possession was either unbreakable, or broken." "The equipment was not necessarily new. Most of it, in fact, seemed to be older than she was, "pre-Reagan admonistration," they both remarked dolefully, as if that had been some Appomattox Court House with the scientists on the losing side." "She'd asked him to tidy things up, but men and barns were like a bucket of forks, tidy was no part of the equation." "Dellarobia was amazed he could see roadkill from the backseat. The animal was as flat as a drive-through hamburger." "She'd seen the man's face. Straining, neck veins and ligaments bulging. He looked like a tied-up horse in a barn fire." "She could certainly bring over some more from Hester's, as they'd canned about fifty quarts. How could a person never have heard of dilly beans?" "It had no shoulder harnesses in the backseat, only lap belts, so the kids' car seats fit in a sigoggling way that was probably unsafe." Author/cover image at top from Sustainable Kentucky, where the book is also reviewed. The side embed is of a Monarch raised at our home last summer. Specifically, Navicula variolata. Photographed by Arturo Agostino for the Nikon Small World Photomicrography 2013 competition. It never ceases to amaze me how complexly beautiful the microscopic world is. One of the Illinois tornados last week. "Here is what my oldest daughter Josie Taylor Wells and I experienced, I am so glad Kerry Gorman Wells and the other girls were out of town when this storm came through. Very thankful we were not injured." From Austrian Domino Art, via Neatorama, where it is noted that five months of preparation and four days of setup went into this stunt. One wonders how many times the 6-meter-tall structure was accidentally toppled during construction. There should be more stuff like this in the world. One woman was punched in the face as she crested a hill on her bicycle in Northwest Washington. Another was hit in the back of the head as she walked to a bus stop. Neither was robbed, and after one attack, the young men laughed as they made their escape. A 15-year-old charter school student said that in “Grand Theft Auto,” “you can just run up to people, and you can just like hit them and they’ll just like fall. It looks kind of funny in the game.” She said she wouldn’t do it in real life. In New York, a 78-year-old woman strolling in her neighborhood was punched in the head by a stranger and tumbled to the ground. In Washington, a 32-year-old woman was swarmed by teenagers on bikes, and one clocked her in the face. In Jersey City, a 46-year-old man died after someone sucker-punched him and he struck his head on an iron fence. "It is amazing how the Washington Post can report about this phenomenon without the issue of racial violence coming up one into the discussion. It is a shame that honesty took a back seat to what is really going on here." "Yep. In the hood, this is called polar bear hunting. The Post knows this but purposefully doesn't report it. Its a rapidly growing hate crime that isn't being acknowledged as such." That phrase — “White Girl Bleed A Lot” — is also the title of a book by Colin Flaherty, which documents both the racial attacks across the nation and the media attempts to cover them up, as well as the local political and police officials who try to say that race had nothing to do with these attacks. I remember exactly where I was. I was on my high school's debate team and we were off at a tournament. For practical reasons, our coach always drove us to tournaments; he would then serve as a judge on some of the debates not involving us, and we would all gather after the last debate of the day in some barren classroom to hear the results announced and get feedback on our performances. On that day, after the last afternoon debate, he didn't meet us. After a brief search, we found him in his car, listening to the news on the car radio, in tears. The news itself was startling, but the sight of encountering one of the pillars of the school faculty, our history teacher, unabashedly crying made the moment surreal for me. Wow. How's that for a relevance stretching half a century into the future. I wish I still had my file box of 3x5 cards. Readers who have sharp memories of 11/22/63 are welcome to offer them in the Comments. "He quite liked nuns. Not that he was a, you know, left-footer or anything like that. No, when it came to avoiding going to church, the church he stolidly avoided going to was St. Cecil and All Angels, no-nonsense C. of E..."
Why are Catholics sometimes called 'left-footers'? 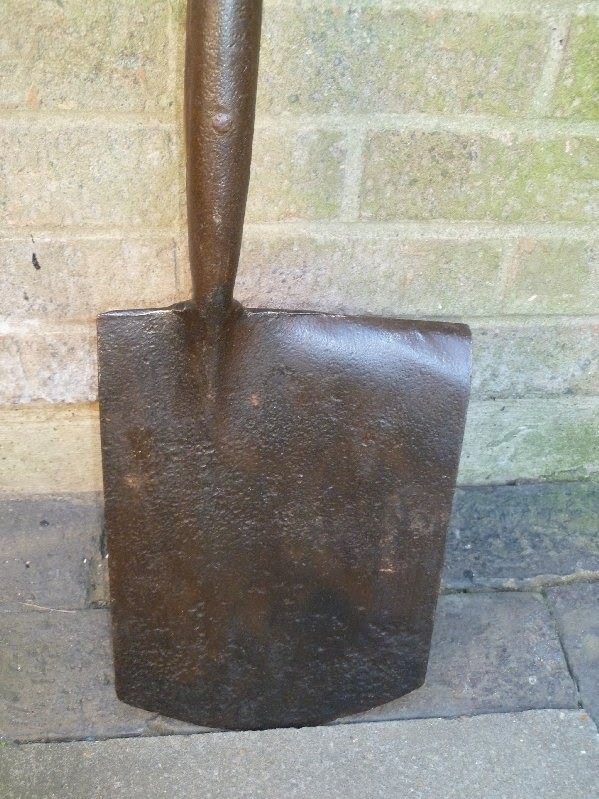 Most types of digging spade in Britain and Ireland have foot-rests at the top of their blades; two-sided spades have foot-rests on each side of the shaft and socket, while an older style of one-sided spade had only one. Two-sided spades may well have been introduced by the Protestant 'planters' in the sixteenth century. By the early nineteenth century specialised spade and shovel mills in the north of Ireland were producing vast numbers of two-sided spades which came to be universally used in Ulster and strongly identified with the province. One-sided spades with narrow blades and a foot-rest cut out of the side of the relatively larger wooden shaft continued in use in the south and west. 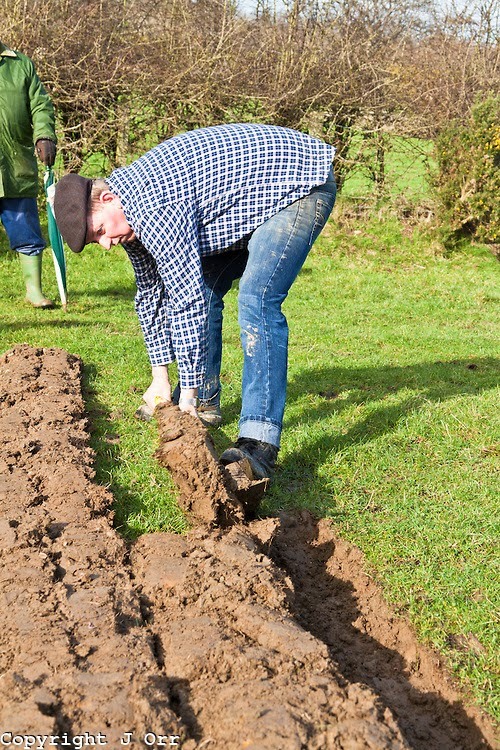 The rural population of Gaelic Ireland retained the Catholic faith and tended also to retain the one-sided spade and 'dig with the wrong foot'. --Hugh Cheape, National Museums of Scotland, Edinburgh. - of a "loy spade" (from the Gaelic word laí, for spade). 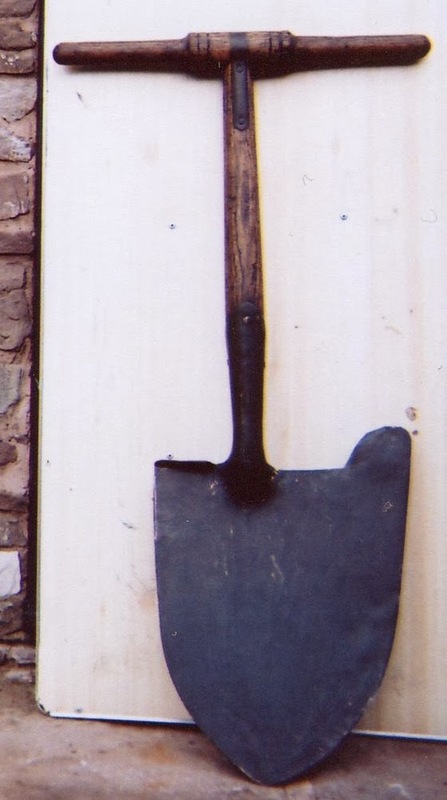 His gallery of photographs of the shovel in use includes a closeup of the narrow-bladed tool (about half the width of a conventional shovel). Top two photos from here (this one appears to me to be designed for use with the right foot) and (cropped from) here. I'll bet the ancient Irishmen would have loved to have had someone attach bicycle handlebars to their spades. Apparently a manifestation of a Santeria ritual. Miami-Dade College anthropology professor Mercedes Cros Sandoval explained, "This is a magical ritual of Cuban origin, probably, with the name 'Sarabanda,' which is a deity from the Congo area that was probably used to affect the relationship of these three young people. To me it is alien, the idea of casting your sins on innocent animals," said Sheehan. Alien, yes, but not inexplicable when one remembers the Western tradition of "sin-eating" and its relationship to Christianity. More details here, via Nothing to do with Arbroath. p.s. - I rather suspect when they named the chicken, the rescuers intended it to be spelled "trouper" rather than "trooper." 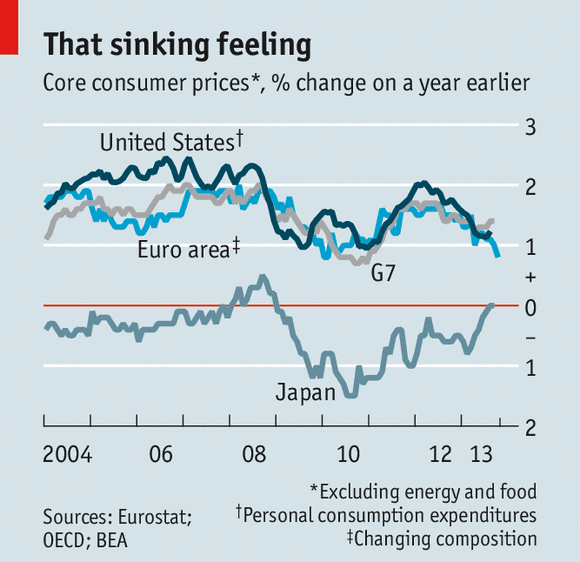 Correlation does not prove causation. 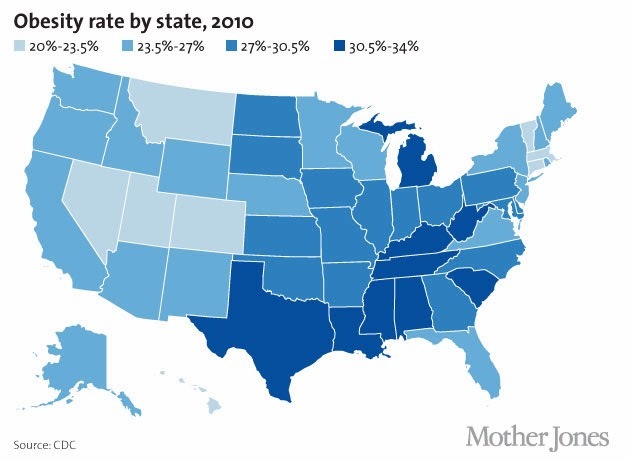 For the potentital interrelationship between the two maps above, see the article at Mother Jones. 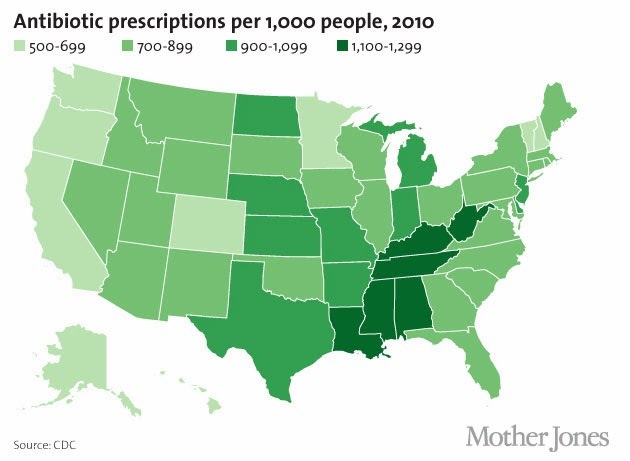 Indeed, a growing body of evidence suggests that antibiotics might be linked to weight gain. A 2012 New York University study found that antibiotic use in the first six months of life was linked with obesity later on. Another 2012 NYU study found that mice given antibiotics gained more weight than their drug-free counterparts. As my colleague Tom Philpott has noted repeatedly, livestock operations routinely dose animals with low levels of antibiotics to promote growth. As always, more at the link. Sixty-one gleaming steel strings run across it, similar to the inside of a baby grand. Each is connected to the keyboard, complete with smaller black keys for sharp and flat notes. But unlike a piano, it has no hammered dulcimers. Instead, there are four spinning wheels wrapped in horse-tail hair, like violin bows. To turn them, Zubrzycki pumps a pedal below the keyboard connected to a crankshaft. As he tinkles the keys, they press the strings down onto the wheels, emitting rich, sonorous tones reminiscent of a cello, an organ and even an accordion. More details at The Age, with a hat tip to reader Shirin for the link. Now it’s certainly true that da Vinci made some sketches of a continuously-bowed keyboard instrument (which he dubbed the “viola organista”) , but the sketches are pretty rough, and most of them show an action that’s quite different from the one in Zubrzycki’s instrument (which uses the same rosin-coated wheels as Haiden’s geigenwerk). In short, Zubrzycki’s instrument seems to me to be a nice reconstruction of a 16th-century German instrument that just happens to share some of the characteristics of da Vinci’s imagined “viola organista” (which Haiden almost certainly knew nothing about). 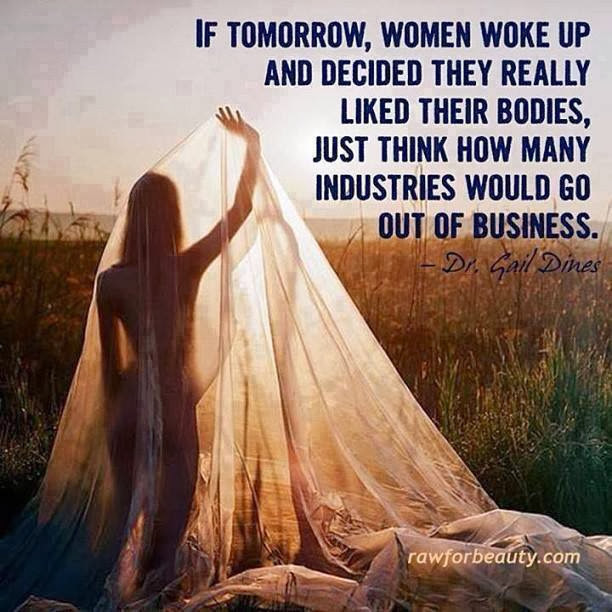 More at the link, found by reader Pam! You are looking at medieval parchment - animal skin - that was stabbed, cut and stitched up. Preparing animal skin, the first step in producing a medieval book, was challenging. The parchment maker had to scrape off the fleshy bits from the one side, and the hair from the other... If the parchment maker pushed too hard while removing the unwanted parts, he would cut right through the surface, which is what happened in the images above. While some cuts were simply stitched up with a thin parchment cord, it also happened that book producers turned these defects into art. 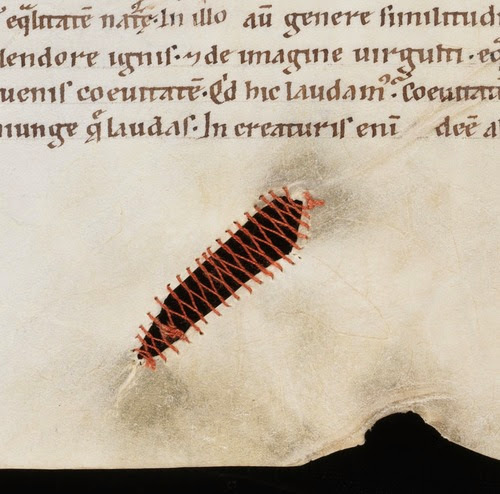 I tumbled these images from a manuscript in Uppsala a while ago, in which holes are plugged with embroidery... In the last image the material was used to attach a missing corner, producing what I tend to call a “Frankenstein page”. 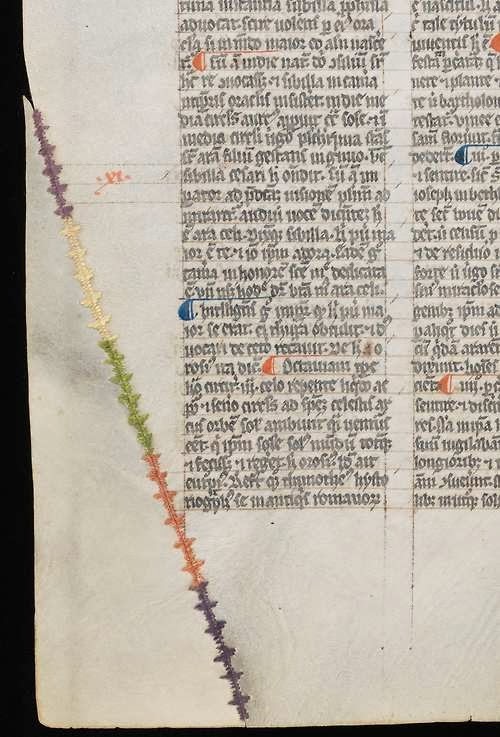 From Erik Kwakkel's incomparable blog about medieval books; there are two additional images of repaired pages at the link. "A coastal town in the Samar province of the central Philippines that was wiped out by Typhoon Haiyan is shown in this Nov. 11 photo. 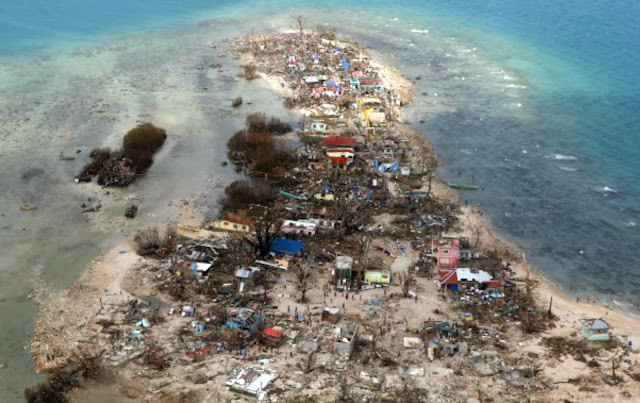 The typhoon, which packed 150 mph winds and 20-foot waves, swept through the archipelago Nov. 8, leaving a trail of devastation in its wake." This coastal town was effectively built on a sandbar, with virtually zero setback from the ordinary high water level. From a photo gallery in the Washington Post. Credit: Erik de Castro / Reuters. From the producers of TED talks, via Neatorama. To define the world of The Hobbit is, of course, impossible, because it is new. You cannot anticipate it before you go there, as you cannot forget it once you have gone... 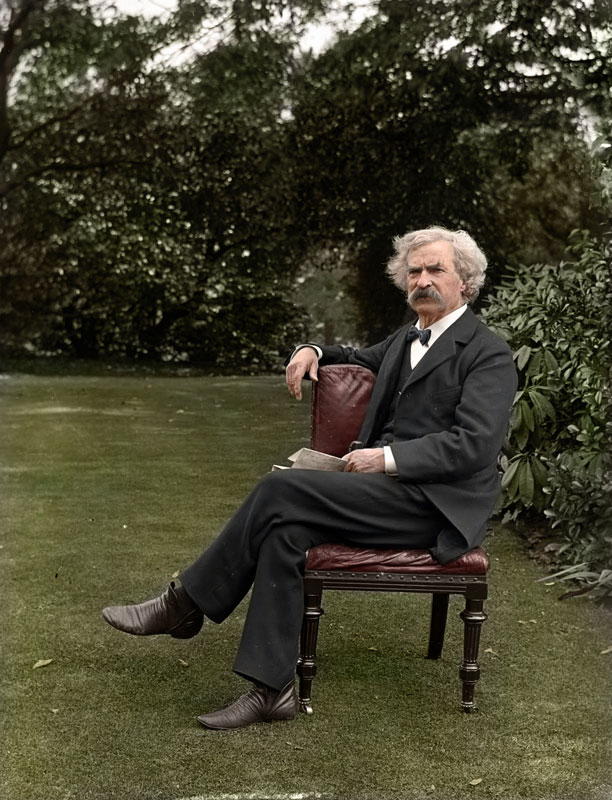 Though all is marvellous, nothing is arbitrary: all the inhabitants of Wilderland seem to have the same unquestionable right to their existence as those of our own world, though the fortunate child who meets them will have no notion—and his unlearned elders not much more—of the deep sources in our blood and tradition from which they spring. For it must be understood that this is a children’s book only in the sense that the first of many readings can be undertaken in the nursery. Alice is read gravely by children and with laughter by grown ups; The Hobbit, on the other hand, will be funnier to its youngest readers, and only years later, at a tenth or a twentieth reading, will they begin to realise what deft scholarship and profound reflection have gone to make everything in it so ripe, so friendly, and in its own way so true. Prediction is dangerous: but The Hobbit may well prove a classic. You can read his review in toto at The Paris Review. This powerful photo says so much about Jim Kelley, and it says even more about running. My friend Jim died this month while out on a run, doing one of his favorite things in the world. A car struck him as he was crossing the street. Jim wasn't a dressy guy. He loved jeans and T-shirts. Teri, Jim’s wife of more than 30 years, told everybody to come to his funeral dressed in their running clothes. That's how Jim would be buried, she said. Come in your tights and your running shorts. Wear your running shoes. I was one of Jim’s pallbearers. When it was time to go to the cemetery, the funeral director had this idea. The cemetery was only a mile away, he said to us. Instead of vehicles following behind, would we want to honor Jim by running behind the hearse? It was a genius idea. 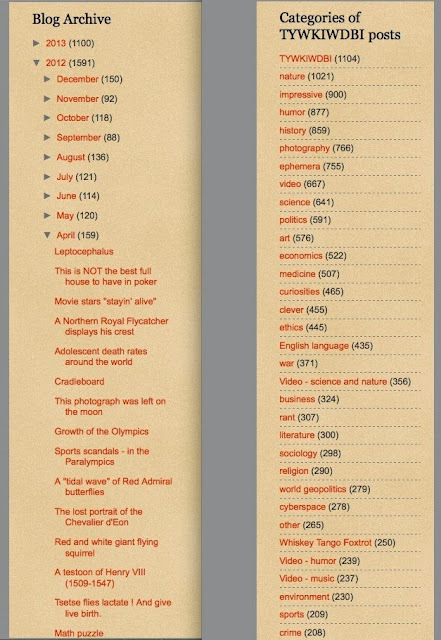 The reports today of the death of Nobel laureate Doris Lessing reminded me that there is a poem I encountered decades ago that I've been unable to identify, despite repeated keyword searches. I'm almost certain that the poet was female, and I think I read it in the 1970s. The poem (brief, perhaps 15-20 lines) describes admiration for a houseplant/potted plant which now has lush foliage but shows no signs of blooming. The poet asks whether, if the plant fails to bloom during this season, she will be able to be satisfied with and appreciate the foliage alone. I remember it as being a reminder that sometimes life happens while we are making plans for the future, and a concise and apt metaphor for careers or relationships that don't fulfill one's initial expectations. Does anything there sound familiar? That poem spoke strongly to me when I was unmarried and just starting on my professional career. 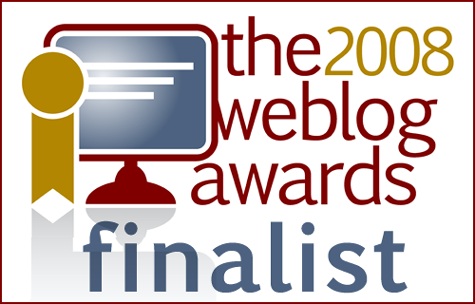 I still find it to be powerful and worth saving here in the blog. Each nation gets a blip and a flashing dot on the map whenever they detonate a nuclear weapon, with a running tally kept on the top and bottom bars of the screen... It starts really slow — if you want to see real action, skip ahead to 1962 or so..."
"I'm not a big shopper, but I swear to avocados that once I start roaming the aisles..."
I presume it originated as a polite way to avoid taking God's name in vain, but I've never encountered it before, either in conversation or six decades of reading. I wonder if this phrase is a local colloquialism from some part of the country where I've never lived. 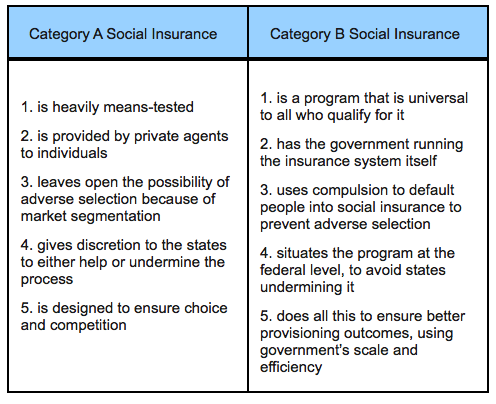 What we often refer to as Category A can be viewed as a “neoliberal” approach to social insurance, heavy on private provisioning and means-testing. This term often obscures more than it helps, but think of it as a plan for reworking the entire logic of government to simply act as an enabler to market activities, with perhaps some coordinated charity to individuals most in need. Via The Dish (more discussion at both links). 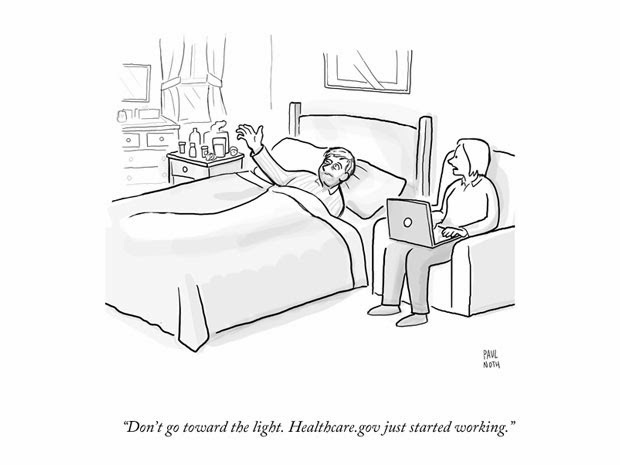 Cartoon from The New Yorker. "My nephew came home from Afghanistan complaining about the food in the mess hall," says Jody Anderson, a retired photographer in southern Oregon. "But the soldiers were allowed only to have coffee makers in their rooms." Steam: The basket at the top is a great place to steam vegetables. You can throw in broccoli, cauliflower or any vegetable that cooks in about the same time as those. Poach: The carafe at the bottom serves as a simple vessel for poaching fish and chicken. 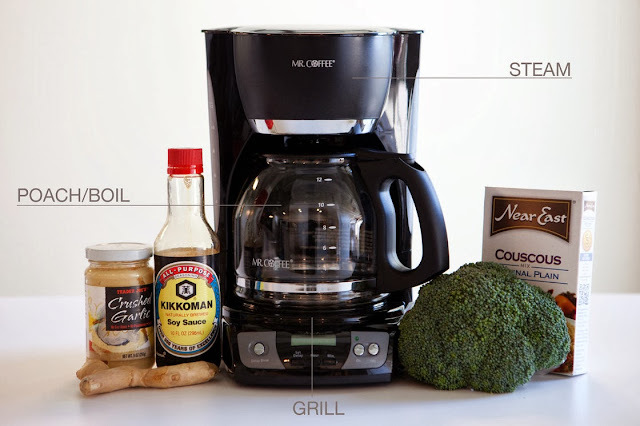 You can also use it to hard-boil eggs or make couscous and oatmeal. Grill: This technique is a bit more advanced — and time-consuming. But if you're really itching for a grilled cheese sandwich or a cinnamon bun in a motel room, the coffee maker's burner can serve as a miniature grill. That makes it a type of comet called a sungrazer, and there is a risk that the comet - essentially a giant ball of rock and ice, will break up when it makes that close approach. Comet ISON, which has the official label C/2012 S1, appears to be on a nearly parabolic orbit which leads scientists to believe that it is making its first trip through the Solar System. This means it may have been dislodged from a vast reservoir of icy debris surrounding the Sun far beyond the planets, called the Oort Cloud. It is a giant ball of rock and ice that is likely to be packed with volatiles including water ice that will erupt as brilliant jets of gas and dust when it is at its best. The article at The Telegraph indicates that this comet should be "fifteen times brighter than the moon." If the comet – which is best observed through a telescope or strong binoculars – survives its scrape with the sun it will reach its most brilliant in early December. Please read Danack's comment from last fall regarding the size and location of the comet. 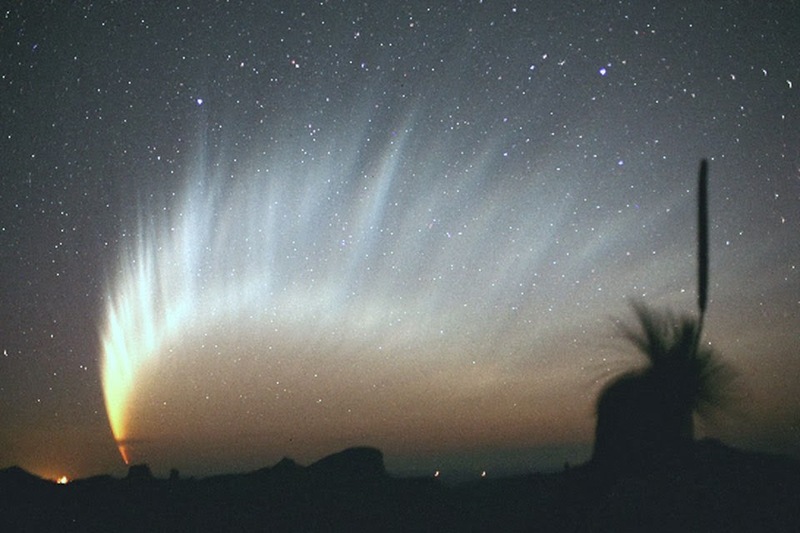 Within the next two weeks of 2013, rapidly brightening Comet ISON might sprout a tail that rivals even Comet McNaught. 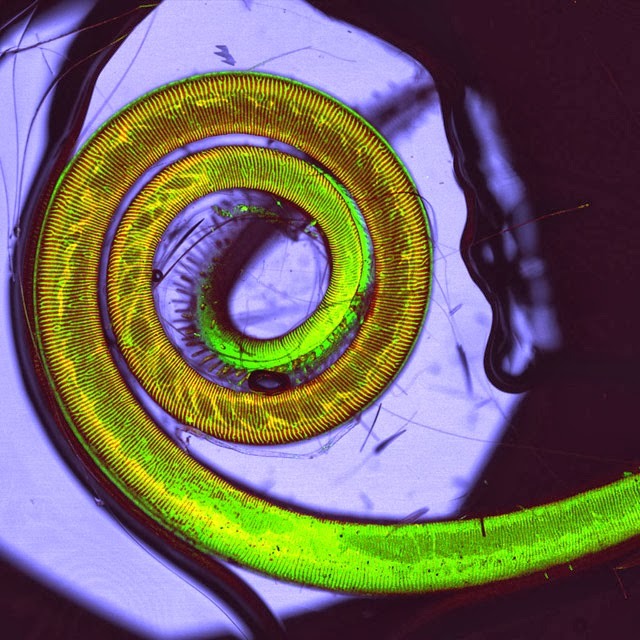 Two photos from the Nikon Small World photomicrography competition for 2013. The top image is of a polished slab of Teepee Canyon agate (credit Doug Moore, UW Stephens Point). The second one puzzles me. 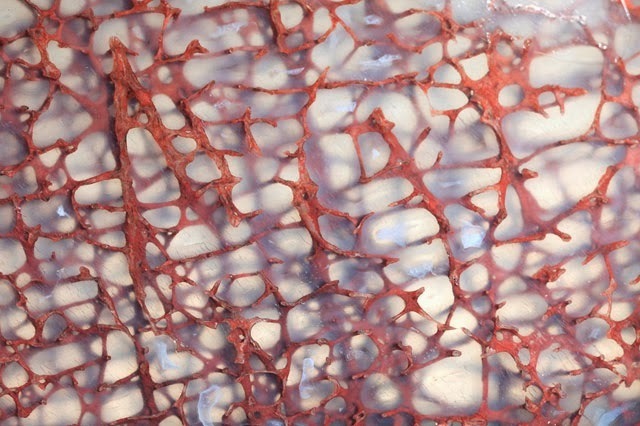 It is a thin section of a dinosaur bone preserved in clear agate (credit Ted Kinsman, Rochester Institute of Technology). I am surprised that the geologic processes that form an agate wouldn't destroy the fine structure of bone matrix. You learn something every day. [T]he potato is the most common cause of solanine poisoning in humans. But how do you know when solanine is present in a potato? The tuber is turning green. 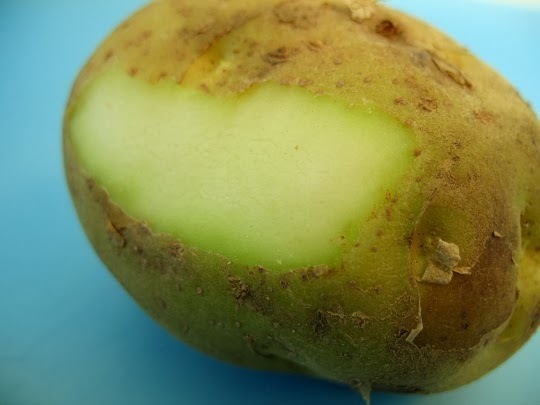 Though the green color that forms on the skin of a potato is actually chlorophyll, which isn’t toxic at all (it’s the plant’s response to light exposure), the presence of chlorophyll indicates concentrations of solanine. The nerve toxin is produced in the green part of the potato (the leaves, the stem, and any green spots on the skin). More at the Smithsonian's Food & Think blog. Photo credit unknown. 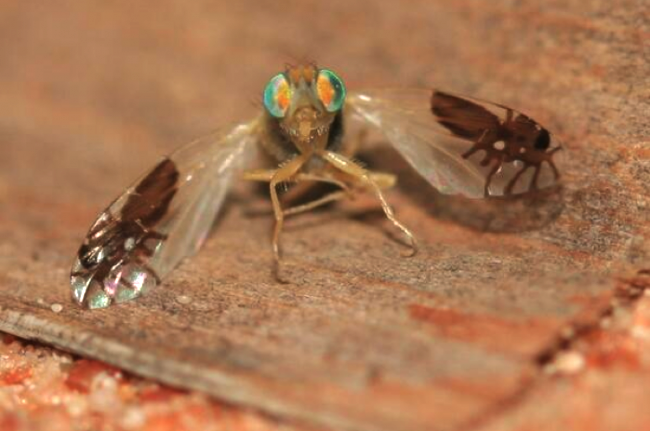 The art appears on the fruit fly’s wings. These translucent appendages contain what has been called the image of an ant. The perfect image is of what appears to be at first glance “ant-like.” Six legs, a pair of antennae, head, thorax and “tapered” abdomen. According to fly specialist Dr Brigitte Howarth, from the Zayed University, the images are “absolutely perfect.” It was the doctor who first spotted the Goniurellia tridens in the UAE. 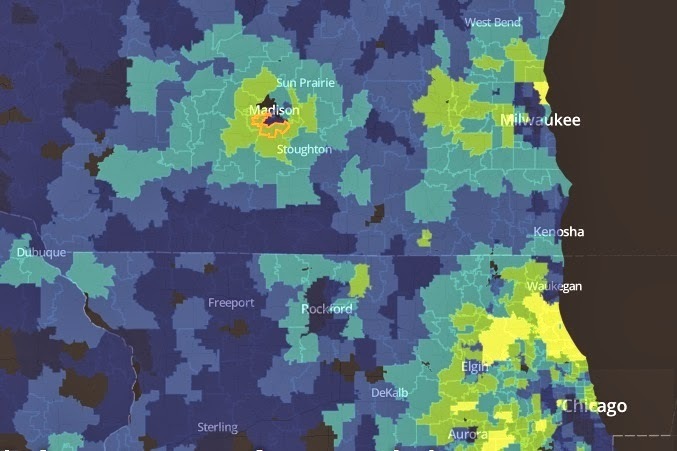 The Washington Post analyzed census data to find Zip codes where people rank highest on a combination of income and education. They are Super Zips. The map... shows the nation’s 650 Super Zips. Among them, the typical household income is $120,272, and 68 percent of adults hold college degrees. That compares with $53,962 and 27 percent for the remaining 23,925 Zips shown. Only Zips with at least 500 adults are displayed. 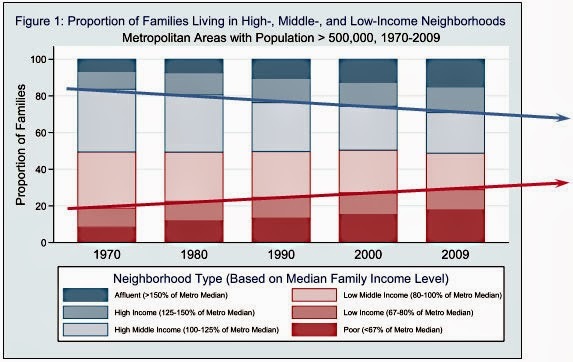 I don't live in a "Super ZIP" (in yellow). I'm in the bile-green category one step down. The image I've embedded is a screencap but the map at WaPo is interactive; you can click on your ZIP code to reveal specific data. They are a very intelligent breed. They are ranked # 7 in Stanley Coren's The Intelligence of Dogs... Labradors as a breed are curious, exploratory and love company, following both people and interesting scents for food, attention and novelty value. In this way, they can often "vanish" or otherwise become separated from their owners with little fanfare. All the mountains on Saturn’s moon Titan are named after peaks in The Lord of the Rings. Agatha Christie was a keen surfer. Lord Kitchener had four spaniels called Shot, Bang, Miss and Damn. At any one time, 45 million people in the world are drunk. The Beatles classic Yesterday was originally entitled “Scrambled Eggs”. Since 1990, more people have been killed by sandcastles than by sharks. Wordsworth had no sense of smell. If Jane Austen hadn’t broken off her engagement, she would have been known as Mrs Harris Bigg-Wither. Sgiomlaireachd (pronounced “scum-leerie”) is a Scots Gaelic word meaning “the kind of friend who only drops in at mealtimes”. There is one Kalashnikov assault rifle in circulation for every 70 people on Earth. There is only one sneeze in the Bible. The only member of ZZ Top who doesn’t have a beard is drummer Frank Beard. Silent letters in words such as “knife” and “psychic” are called aphthongs. Splenda was an insecticide that became a sweetener when a lab assistant misheard an instruction to “test it” as “taste it”. For more, see the book - and the program (which sadly doesn't air in this country). I believe I recall one of the QI elves visiting this blog some years ago. Still here?? "A mouth that looks like two saws on the side of a barbed sword"
"How responsible are these non-vaccinating parents for my pertussis? Very. A study recently published in the journal Pediatrics indicated that outbreaks of these antediluvian diseases clustered where parents filed non-medical exemptions – that is, where parents decided not to vaccinate their kids because of their personal beliefs. The study found that areas with high concentrations of conscientious objectors were 2.5 times more likely to have an outbreak of pertussis." 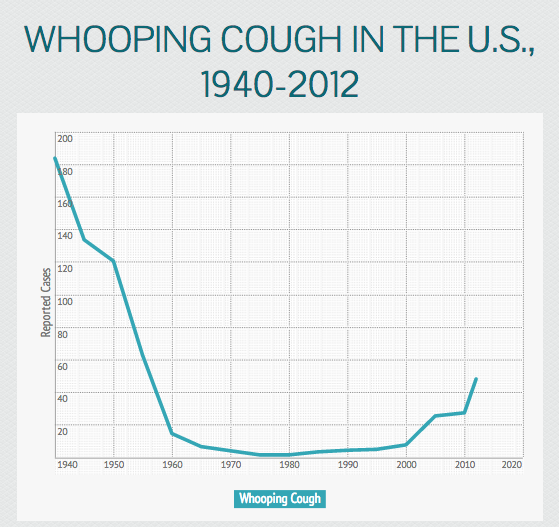 Graph credit Jen Kirby, based on data from the CDC. Via The Dish. 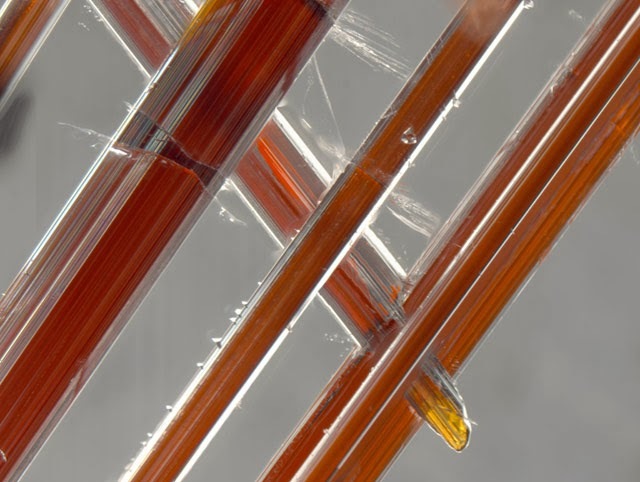 "Rutile crystals (titanium oxide) included in rock crystal (quartz) (40x). Technique: Brightfield, Fiber Optic Illumination." 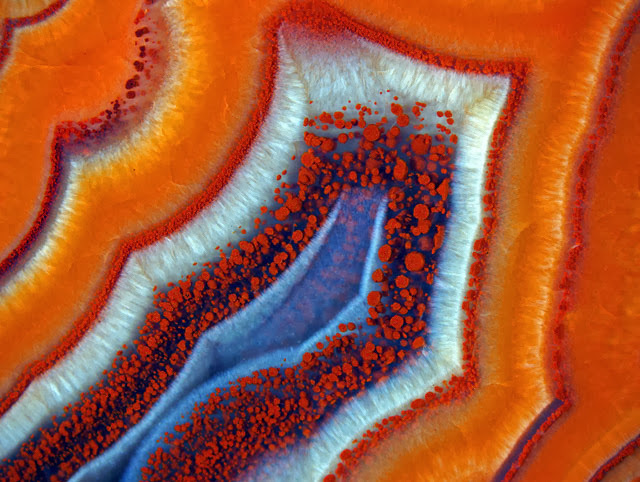 From the Nikon Small World 2013 photomicrography competition. In February 2012, German authorities raided the apartment of 75-year-old collector Cornelius Gurlitt and seized 1,406 works of art, a spectacular trove with a value that has yet to be estimated. It includes works by Liebermann, Marc Chagall, Franz Marc, Karl Schmidt-Rottluff, Max Beckmann, Emil Nolde, Picasso and Henri Matisse, among others. There were also many prints and graphic works, which Gurlitt had kept in a cabinet. At the press conference, it was not clear what exactly the collector was being accused of. There is talk of tax evasion and embezzlement, but the legal framework for the authorities' confiscation of the collection seems murky at best. 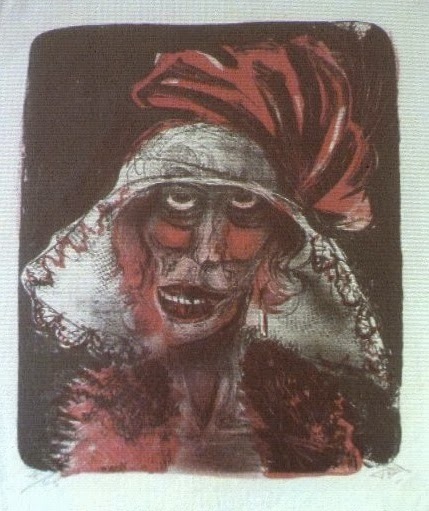 Image (cropped from the original photo) is of a reproduction of a painting by Otto Dix that Hitler and his henchmen considered to be "degenerate" art. A four-minute video (a "screenlink" comprised of separate events, not a continuous domino fall) illustrates some of the remarkable effects that can be achieved using falling dominos. 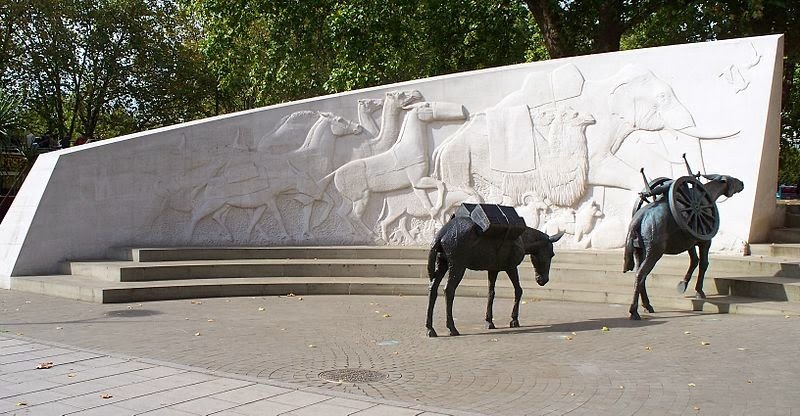 The sculpture in the photo is the Animals in War Memorial in Hyde Park. 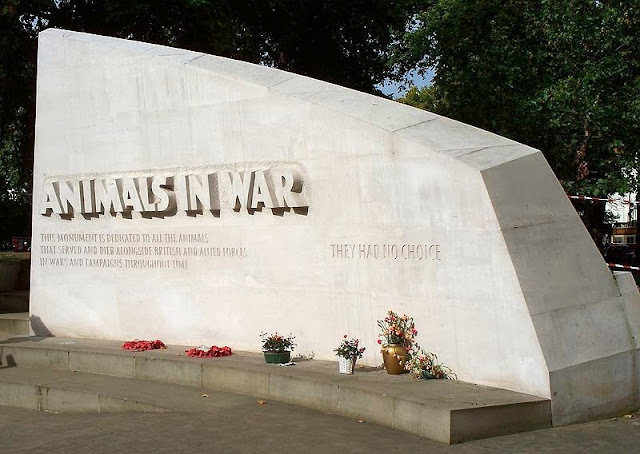 The memorial was inspired by Jilly Cooper's book Animals in War, and was made possible by a specially created fund of £1.4 million from public donations of which Cooper was a co-trustee. The memorial consists of a 55 ft by 58 ft (16.8 m by 17.7 m) curved Portland stone wall: the symbolic arena of war, emblazoned with images of various struggling animals, along with two heavily-laden bronze mules progressing up the stairs of the monument, and a bronze horse and bronze dog beyond it looking into the distance. The government sent out MI5 agents to watch animal rights activists, considered the mass euthanasia of all ‘non-essential animals,’ sponsored a clandestine anti-dog hate campaign and sanctioned the criminal prosecutions of cat owners for giving their pets saucers of milk. The day Hitler invaded Poland, a BBC broadcast confirmed it was official policy that pets would not be given shelter. Panic-stricken people flocked to their vets’ offices seeking euthanization for their pets. That night, distressed animals cast out by their owners roamed the blacked-out streets, and five days of mass destruction followed. London Zoo was also decimated. The black widow spiders and poisonous snakes were killed, as were a manatee, six Indian fruit bats, seven Nile crocodiles, a muntjac and two American alligators. Two lion cubs were put down, too. in wars and campaigns throughout time"
From the Nikon Small World photomicrography competition for 2013. "If you think about church, there's very little that's bad. It's singing awesome songs, hearing interesting talks, thinking about improving yourself and helping other people — and doing that in a community with wonderful relationships. What part of that is not to like?".. "In the U.S., there's a little bit of a feeling that if you're not religious, you're not patriotic. I think a lot of secular people say, 'Hey, wait a minute. We are charitable, we are good people, we're good parents and we are just as good citizens as you and we're going to start a church to prove it.."
During competitions, bodybuilders are required to cycle through a number of mandatory poses. This man does so with a bit of extra style and flair. 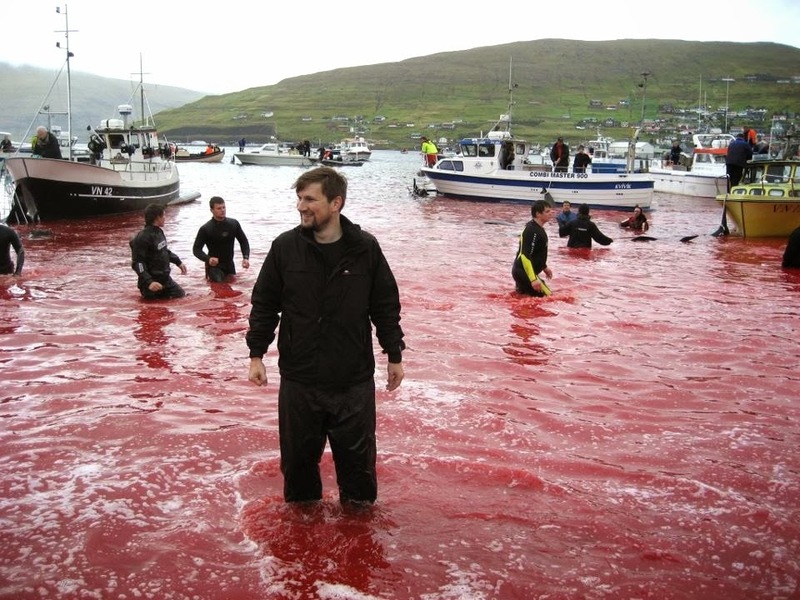 Whaling in the Faroe Islands in the North Atlantic has been practiced since about the time of the first Norse settlements on the islands. It is regulated by Faroese authorities but not by the International Whaling Commission as there are disagreements about the Commission's legal competency for small cetaceans. Around 950 Long-finned Pilot Whales (Globicephala melaena) are killed annually, mainly during the summer. The hunts, called grindadráp in Faroese, are non-commercial and are organized on a community level; anyone can participate. The hunters first surround the pilot whales with a wide semicircle of boats. The boats then drive the pilot whales slowly into a bay or to the bottom of a fjord. The primary reason for the Faeroes abstaining from joining the EU was in an effort to prevent the EU from meddling in their fishing policies. The slaughter of cetaceans is illegal within the European Union. More details, photographs, and a couple videos at this link. More at the link, and in this companion article. "Holding Nature's land speed record for ten million consecutive years." "The adaptation plays with literal versions of many of the things described in the poem, capturing its humor and poignance." 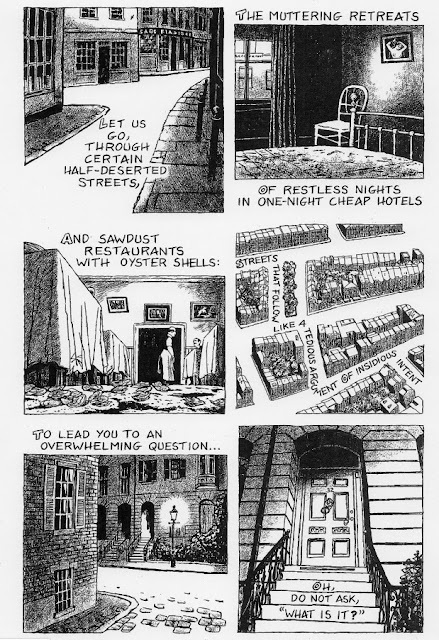 The entire illustrated poem is viewable here. (For the full text, see also my 2012 post on "Spooning - and Prufrock." 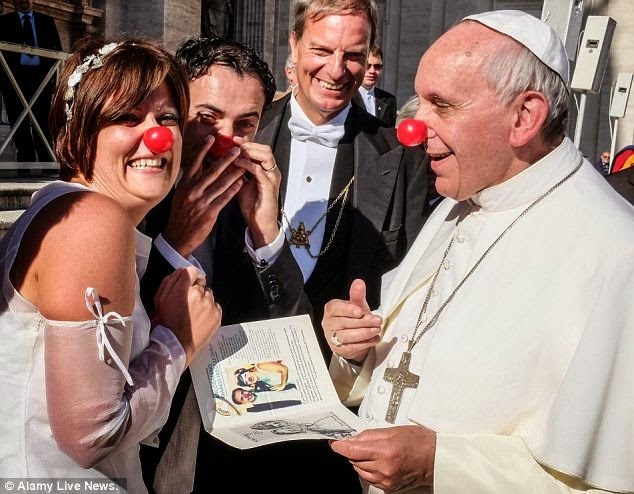 Addendum: Found this story at Reddit today - "A couple being married at the Vatican were volunteers at a charity that uses humor therapy for sick children. So, when they met Pope Francis..."
It's the sort of behavior that wouldn't surprise me coming from a Lutheran clergyman, but that I would never previously have expected from a Pope. "Germany’s recently suspended “Bishop of Bling” faces the prospect of seeing his lavish multimillion euro residence turned into a refugee centre or a soup kitchen for the homeless, Catholic church officials in his home diocese announced today. Bishop Franz Peter Tebartz-van Elst was formally suspended last week amid accusations that he had spent over €31m (£26.5m) on renovating his official residence in Limburg. 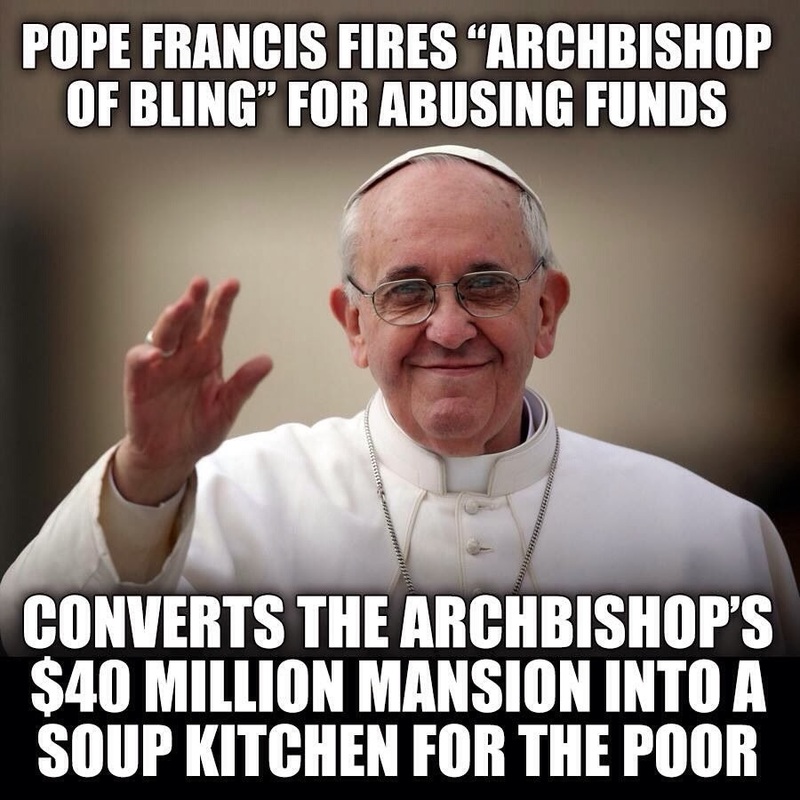 The charges, which earned the 53-year-old bishop his nickname, provoked outrage among German Catholics." A marvelous image to illustrate the term "arborizing." From the Nikon Small World photomicrography competition for 2013. 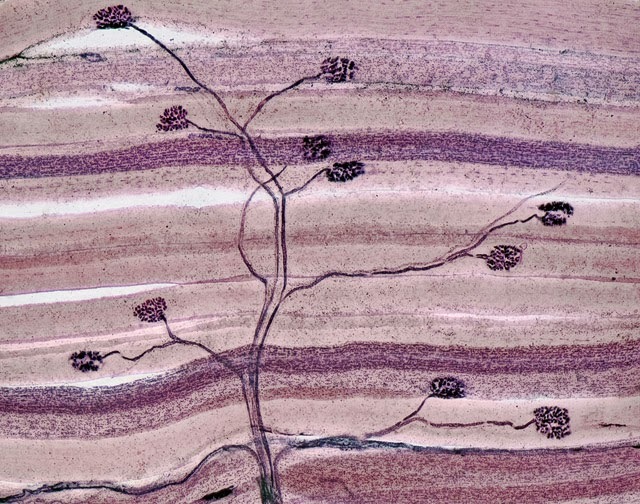 I love browsing through the galleries each year because of the seemingly endless (but not unenjoyable) hours I spent peering through a microscope during my graduate education and faculty years. 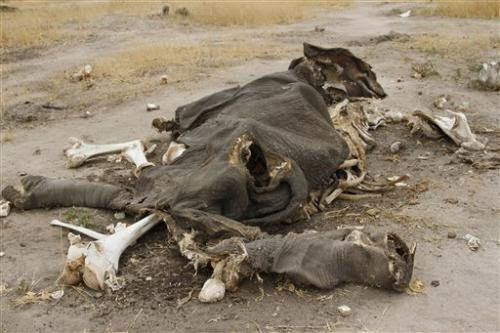 The stench of rotting elephant carcasses hangs in the air in western Zimbabwe, where wildlife officials say at least 91 elephants were poisoned with cyanide by poachers who hack off the tusks for the lucrative illegal ivory market. Tusks of the poisoned elephants are thought to have been smuggled into neighboring South Africa through illicit syndicates that pay desperately poor poachers a fraction of the $1,500 a kilogram (2.2 pounds) that ivory can fetch on the black market. Kasukuwere said Hwange park, Africa's third largest wildlife sanctuary after the Serengeti in Tanzania and South Africa's Kruger National Park, has only about 150 rangers and few fully operational off-road vehicles for an expanse that ideally should have a staff of at least 700. Scores of vultures, the first predators at a kill, have died from the cyanide. 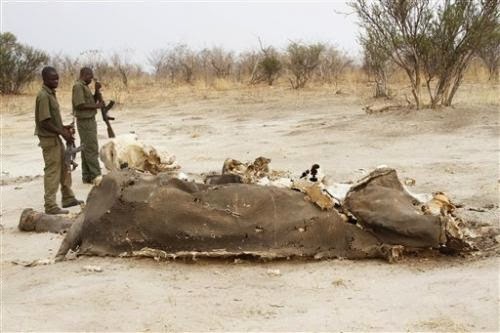 Rangers say their absence makes the ecological impact of the poisonings much harder to fight and control. 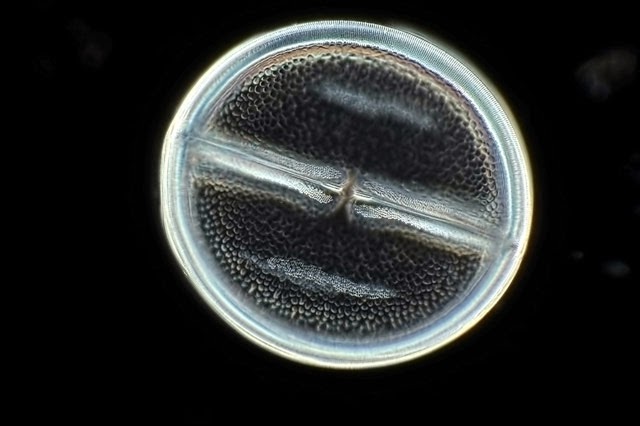 Photos and text via PhysOrg. In September 1968, the budding rock star paid a Beverly Hills auto dealer $3,500 for the three-year-old sports car. When she bought it, the Porsche was a factory-painted "oyster white." For a flamboyant singer who wore rose-colored glasses and feather boas, that wouldn't do. So she got roadie Dave Richards to paint it with swirling psychedelic images, including Mount Tamalpais on one fender and a portrait of her with her band, Big Brother and the Holding Company, on another. The singer's 1965 Porsche 356c Cabriolet, which she bought when she was living in Larkspur, is usually enshrined in the Rock and Roll Hall of Fame in Cleveland. It came to Marin from the Grammy Museum in Los Angeles, where it was on loan. "They used regular house paint," Michael Joplin recalled. "They were just playing around, saying, 'Hey, let's make an art car.' They were having a lot of fun. It was a convertible, and she would drive it around with the top down. People would leave notes for her on it." More details about the history of the car at the YouTube "about" section, where my objection re the choice of the song in the video is anticipated by the comment that her iconic "my friends all drive Porches, I must make amends" lyrics couldn't be used because of copyright protection. 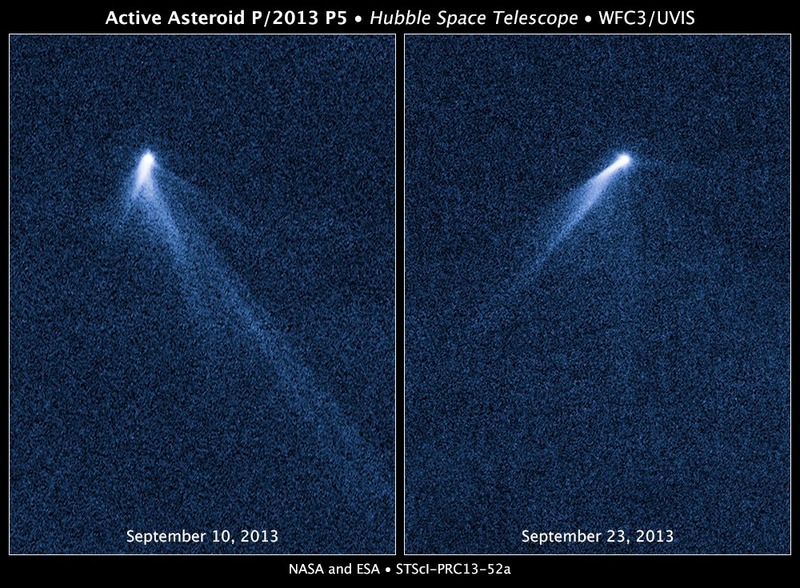 NASA identifies a "weird and freakish object"
Normal asteroids should appear simply as tiny points of light. But this asteroid, designated P/2013 P5, has six comet-like tails of dust radiating from it like spokes on a wheel. The asteroid could possibly have been spun up if the pressure of sunlight exerted a torque on the body. If the asteroid's spin rate became fast enough, Jewitt said, the asteroid's weak gravity would no longer be able to hold it together. Dust might avalanche downslope towards the equator, and maybe shatter and fall off, eventually drifting into space to make a tail. So far, only a small fraction of the main mass, perhaps 100 to 1,000 tons of dust, has been lost. The 700-foot-radius nucleus is thousands of times more massive. Oddly, what caught my eye (after Ms. Hepburn of course) was the garbage can, which reminded me that once-upon-a-time garbage cans were lined with newspapers, not with pull-closure plastic bags. And they used to be small, not 30 gallons in size. The others are worth browsing. "Happy as a dead pig in the sunshine"
"When a pig dies, presumably in a sty outside, the sun dries out its skin. This effect pulls the pig’s lips back to reveal a toothy “grin,” making it look happy even though it’s dead. This phrase describes a person who’s blissfully ignorant of reality." "We're living in high cotton." "He could eat corn through a picket fence." "You look rode hard and put up wet." "That thing is all catawampus." "He's got enough money to burn a wet mule." And others. I spent two decades living in "the south," but some of these were new to me. Die Maiers- trapeze from Joachim Mohr on Vimeo. 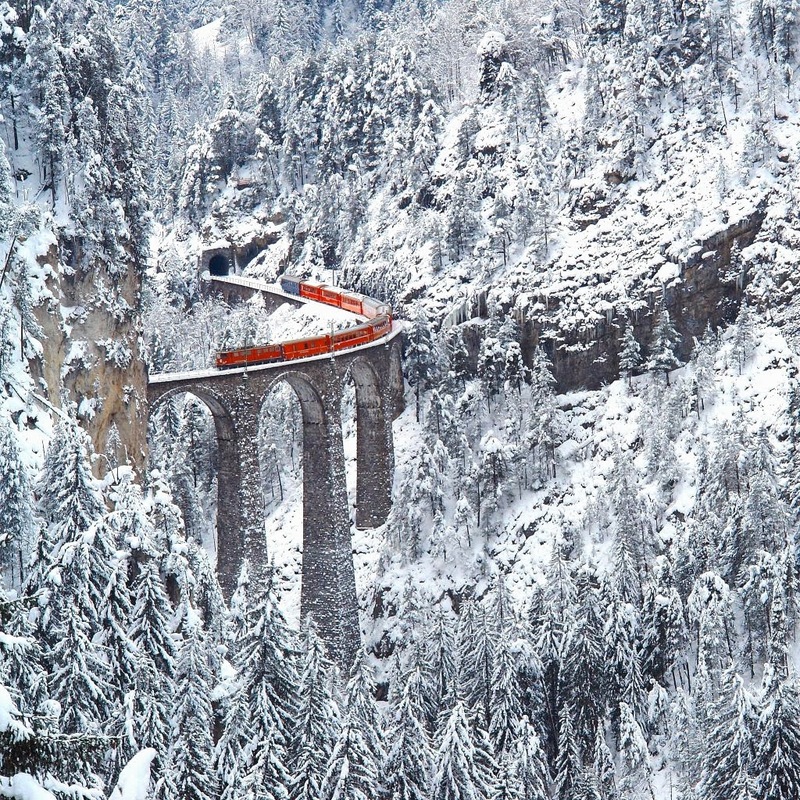 Designed by Alexander Acatos, it was built between 1901 and 1902 by Müller & Zeerleder for the Rhaetian Railway, which still owns and uses it today. A signature structure of the World Heritage-listed Albula Railway, it is 65 metres (213 ft) high, 136 metres (446 ft) long, and one of its ramps exits straight into the Landwasser Tunnel. Blogged for the beauty of the image, but I'm also impressed by the labor and skill that were involved in its construction. I suppose it's mandatory to add: "Why a no chicken?" 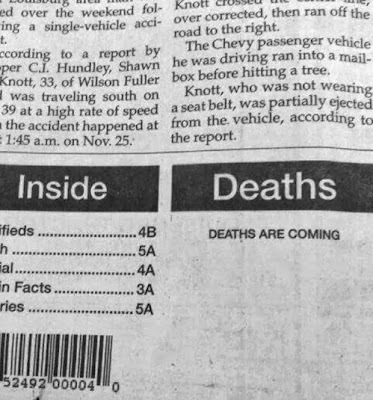 Photo via, and via Reddit. 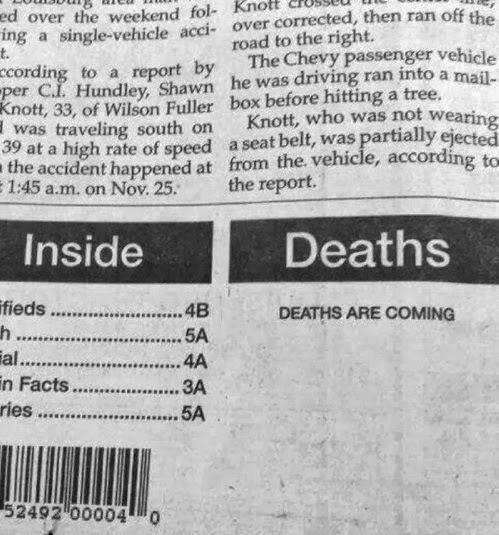 Image cropped and lightened from the original, via Bad Newspaper. A sharp-eyed anonymous reader of this blog noted this curious juxtaposition in an online article at The Wilson Quarterly. A read time not of "about 15 minutes," but of "15m 39 sec." This kind of false or needless precision crops of in lots of places, and drives me crazy too. But the use in an article with this title is particularly odd. "Pink for boys, and blue for girls"
Pink and blue arrived, along with other pastels, as colors for babies in the mid-19th century, yet the two colors were not promoted as gender signifiers until just before World War I—and even then, it took time for popular culture to sort things out. More, and link to source, at The Dish. "“We never speak of dying,” a misspelled ad boasts, quoted in a roundup of hair coloring techniques available in the city. 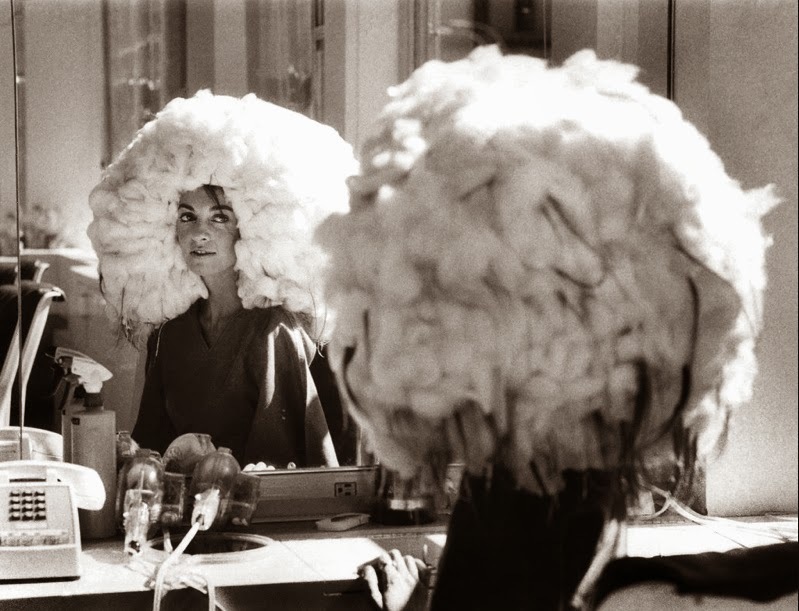 While the procedure pictured here — which required 1,000 feet of cotton stripping — might resemble some kind of April Fool’s prank carried out by the colorist, it was apparently a real thing for fine hair, called balayage au cotton." Foils often end up looking contrived - a neat row of uniform highlights. When a section of hair is colored using a foil, the entire section is saturated with color resulting in dense, unnatural stripes of color. Balayage color is painted in soft brush strokes across the surface of the hair, leaving you with natural-looking swipes of color that flow from thick to thin and play off the hair's natural movement. Even better, balayage won't leave you with any signs of demarcation, creating a softer and more manageable grow-out. I suppose women readers have known about all of this for years, but it was new to me. You learn something every day. "From ancestor worship to descendant worship"
There is the greater dismay we seem to feel at youth unemployment than at the poverty of pensioners, although some of the most disturbing scenes I’ve witnessed have been in the homes of the elderly. There is the way that older people are expected to give far more to voluntary organisations. We assume that the over-65s will take on almost the entire burden of supporting political parties, for which the young occasionally vote, and of maintaining the churches in which the young like to marry. We accept too easily that the young should not be called upon to carry the burden of sustaining communities because "their lives are too busy". People who might once have been public figures, deeply invested in their work, are instead busy serving their children. Ours is a culture not of ancestor worship but of descendant worship. Children must sense that nothing an adult does is more important than their own desires. All political questions seem to come down to the interests of "the next generation". Are you old enough to remember "card catalogues"
DNA testing reveals fake "herbal supplements"